On December 3, 2017, the Post-Trip symposium of the TOMODACHI J&J Disaster Nursing Training Program took place at the TKP Garden City Sendai Kotodai. All the participants, mentors, and staff arrived in Sendai on the previous day to prepare for the symposium. Since the Post-Trip Seminar in September, the participants tested and implemented the activities they developed and overcame the difficulties of making the projects successful. Along the way, the participants came to realize the challenges of trying to do everything by themselves. They therefore learned the importance of asking for other people’s support, including tips on how to ask for help. They were also deeply moved by the accomplishments they all made by giving back to their communities. At the Post-Trip symposium, each participant shared the biggest learning from the eight-month long program. They developed their presentations by reflecting on what resonated most with them and the most valuable lessons from the program. In preparation for the symposium, the participants spent the previous day receiving feedback from mentors and staff, and brushing up their presentation slides and techniques. On December 3, many guests, including those who have been involved in the program since its inception, attended the symposium to hear the presentations. Kaoru Omiya and Tomoka Yamaguchi explained the overall program, and all of the eight participants presented their respective learning experiences. Additionally, 2015 program alumnae Mikiko Sato and 2016 program alumnae Miki Akeshita presented on their experiences following the program and new learnings they have come to realize since they started working. Sarah Birch from the Children’s National Health System, who implements the program in the United States, also shared the program’s accomplishments from over the past three years to the audience. 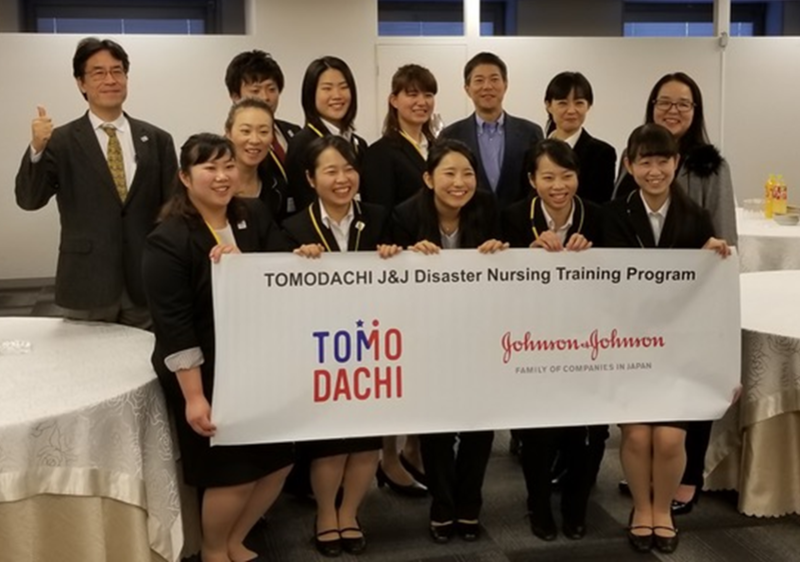 Lastly, the room was filled with applause and excitement when Mr. Tamotsu Hiiro, Chairman of Johnson & Johnson Contributions Committee and President of Johnson & Johnson K.K., announced the company’s continued commitment for the TOMODACHI J&J Disaster Nursing Training Program in the upcoming years. A reception was held after the Post-Trip symposium in appreciation and celebration of the program’s success over the past three years. In addition to current participants and alumni, nursing students interested in applying for the program were also invited to join. Building upon the past three years’ accomplishments, the program is expected to grow even further in collaboration with many supporters and alumni.